Chronic Obstructive Pulmonary Disease (COPD) is an umbrella term that encompasses 2 main disorders--- emphysema and chronic bronchitis--diseases that are characterized by obstruction to air flow in and out of the lungs. Emphysema and chronic bronchitis frequently coexist. Thus physicians prefer the term COPD. COPD is a slowly progressive disease of the airways that is characterized by a gradual loss of lung function. 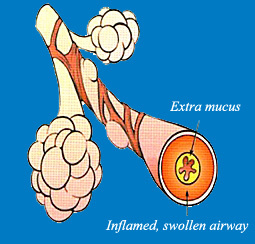 In Chronic Bronchitis, the airways become swollen and inflamed and produce large amounts of mucus. The swollen tissues and mucus make breathing difficult. The airways often become easily infected. The symptoms of COPD can range from chronic cough and sputum ('phlegm') production to severe disabling shortness of breath. In some individuals, chronic cough and sputum production are the first signs that they are at risk for developing the airflow obstruction and shortness of breath characteristic of COPD. In others, shortness of breath may be the first indication of the disease. Individuals with COPD increasingly lose their ability to breathe. Acute infections or certain weather conditions may temporarily worsen symptoms (exacerbations), occasionally where hospitalization may be required. The progression of the disease and the loss of lung function can be so gradual that, presently, many patients don't realize they have COPD till late. Check if you are likely to have COPD. People with COPD may first notice breathlessness during activities such as climbing stairs and walking uphill. There is often wheezing and coughing that brings up mucus. Over time, the breathlessness worsens, sometimes to the point where dressing and bathing are also difficult. Oxygen levels in the blood may fall and carbon dioxide levels may rise, which can cause tiredness, poor concentration and heart strain. 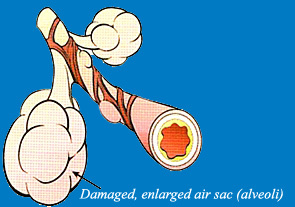 The strained heart may enlarge and lead to swelling of the ankles and legs called edema. The World Health Organization (WHO) estimates that COPD as a single cause of death shares 4th and 5th places with HIV/AIDS (after coronary heart disease, cerebrovascular disease and acute respiratory infection). In developed countries such as the US, COPD is the only major fatal disease the death rate of which is increasing - a disparity all the more striking amid the dramatic decline in deaths from heart disease and stroke. The WHO estimates that in 2000, 2.74 million people died of COPD worldwide. In 1990, a study by the World Bank and WHO ranked COPD 12th as a burden of disease; by 2020, it is estimated that COPD will be ranked 5th. According to the WHO, passive smoking carries serious risks, especially for children and those chronically exposed. The WHO estimates that passive smoking is associated with a 10 to 43 percent increase in risk of COPD in adults.